Personal Brand - What is it and how do you promote it? Jennifer Holloway from Spark Branding is no stranger to the New Media Breakfast, she has been taking part and sharing her knowledge since 2011, we are delighted she has agreed to come back again an speak at the July New Media Breakfasts in Edinburgh (18th July) and Glasgow (26th July). Jennifer, as you would expect, brings her very own personal brand to bear on her presentations which are informative, humourous and extremely beneficial to everyone - yes, everyone has a personal brand whether they know it or not! You’ve heard the phrase but do you really know what it means? You think you might have one, but do you really know what it is? You know you should be promoting it, but do you really know what to do? 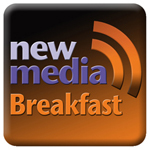 Jennifer Holloway, author of Personal Branding for Brits, will be going back to basics in our next New Media Breakfast. She’ll explain what a brand is and even help you to start thinking about yours. She’ll also share three ways you can promote your brand without sounding like an idiot. And as anyone who’s seen Jennifer’s sessions before can attest, she’ll be doing it with a lot of energy and a big dollop of humour! You’ll also have a chance to buy a copy of her book at a special rate for NMB attendees, so bring along a tenner on the day and she’ll even sign it for you!